For those who adhere to a realpolitik interpretation of international affairs, a bigger military is akin to a greater share of global power and influence. Whether such a framing of international relations is what dictates patterns in military spending or not, global defense spending appeared to plateau from 2009 to 2017. The largest contributor to the vast sums of money spent on defense and arms each year is the United States military. A look at the 15 countries with the highest military spending in 2017 shows that the United States spent almost 610 billion U.S. dollars, more than double that of China in second place. This high amount of spending has helped to maintain the military dominance of the United States around the world. 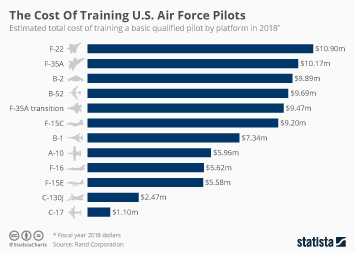 This stretches to a number of aspects and is evident in the United States accounting for more than a quarter of active military aircraft globally. Although current aircraft are important, new drone technology has created a new arms race arena. By 2022, the expected market value for military UAVs worldwide is set to reach 15 billion U.S. dollars. Given the variance in country sizes and the strength of their respective economies, military expenditure as a percentage of gross domestic product is a useful tool for evaluating the importance particular states place on their military. In this measure Saudi Arabia stands out from all other countries. In 2017, 10 percent of the country’s gross domestic product was spent on defense and arms. But when it comes to military power, size certainly matters. As such, larger states such as the United States and China have massive militaries despite spending less as a portion of their gross domestic product. China has the biggest military in the world in regards to military personnel, counting almost 2.2 million people in their ranks. Despite placing more emphasis on technology and weaponry, the size of the United States military still numbers almost 1.3 million.